We all have many accounts on many systems. Each is a identity persona we create but may be controlled by others who have their own interests in mind and not our own. We can own our own identities and the Bring Your Own Identity Cooperative, BYOID.net aims to make that a reality by our cooperation. You could prove your identity once instead of to each site you visit. You could develop a trustworthy anonymous identity online that is good everywhere for all your persona. You could manage your identity and other personal information resources yourself with proven privacy. Instead of using insecure email, chat and social networks everyone could use emerging decentralized social networking with proven security and privacy. Instead of a “To:” list you have a “who needs to know?” and “who’s allowed to see?”. seeding new BYOID identities from whom permission will be requested if you want to share each others information resources. They then become BYOID cooperators strengthening each others identity..
Strong anonymous translucent identity with trusted interaction is a goal of BYOID, both trustworthy to be safe and opaque to protect personal privacy. Collaboration in our webs of trust on building strong pseudo anonymous unique identities and reputation we trust for ourselves and our communities might enable enterprise and governance by consent. Identity is personal and the user ought be in control of their personal information. Groups ought to be in control of the group memory knowledge map/ledger. One ought be in control of the authentication factors required to act as them on the internet. Depending on the use case factors may involve proof you control a private key, biometrics, location, knowledge. behavior, etc. We ought have a single identity we own aggregating all our persona among our communities. The standards and open source software available make all this possible today. We need to make it easy for ordinary users and communities to employ what is available now and comply with the emerging standards in a self-sovereign manner where they are not forced to depend on particular systems or services. Self sovereign identity means you are your own identity provider for all your persona. Your persona become trusted as attestations and proofs accumulate in webs of trust. Individuals and groups are the best source of information about themselves when attested to in our webs of trust. We are an informal networking association planning to form not for profit identity cooperatives co-creating strong interoperable self sovereign identity P2P, in teams and organizations that may potentially be trusted by federations and national identity ecosystem. Proposals to RChain coop, Pithia and Reflective Ventures for funding interoperability for our communities are being considered. Self-Sovereign User Agent Tech Architectures form the heart of BYOID having our interface to our information resources not their interface.. The first potential cooperative is growing out of an existing stalled BYOID cooperation (log). Current BYOID collaborators have represented ProvenSecure.com, FreeTrust.org, Synereo, DivvyDAO.org, RChain.coop, Holochain and IIW. All our communities are facing the same issues managing and connecting different accounts for different services used by the community and have the challenge of enabling their users to use self-sovereign identities. Cooperating on solutions eliminates redundancy of everyone solving the issues independently. Join us. Help make it happen. Participate in the living BYOID Cooperative current state document Become a founding director and be gifted project tokens enabling you to support BYOID initiatives including those in your own organization. The document outlines possibilities being considered in our evolution to be decided by the coop members. 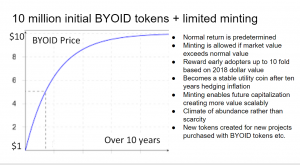 The market value of the interoperable self sovereign identities and tools created give value to the byoid tokens along with the utility of being useful for byoid services and use as a medium of exchange in the byoid network association. Watch our inception video to see if you are interested in engaging as a director.